I am a dystopian lover. Usually the only recommendation that I need for a book is that it is set in a dystopian future and I will give it a chance. Here is a list of some of my favorites that I have read. Linking up with The Broke and the Bookish. Uglies– Set in a future where all teenagers undergo a surgery to make them pretty. Tally discovers over the course of the first book just what else the surgery changes. Overall, this is not my favorite dystopian series, but worth a read. I liked the first two books more than the last two. The Handmaid’s Tale– I read this more graphic dystopian in a college lit class and fell in love. In a society where fertility is rare and most babies born aren’t viable, women who have had previous children are taken as “handmaids” for the purposes of procreation. This book is more appropriate for a mature audience, but it tackles the evils of a Utopian society beautifully. Alas, Babylon– While not the oppressive dystopian books I am used to reading, Alas, Babylon tells the story of a small Florida community after the nuclear apocalypse. I absolutely love this book. The Hunger Games– It seems almost everyone has read these books about children forced to kill each other in a large arena. Although my husband and I are split over the ending, he loved it and I thought it was just OK, these books definitely belong on this list. Matched– Cassia lives in a society where every one is “matched” with their ideal spouse when they are a teenager in a big elaborate ceremony, but what is Cassia to do when she is accidentally matched with two people? Delirium– Set in a future where loving and being in love is considered a disease, every citizen is “cured” from love on their 18th birthday. It is a cure that Lena completely believes in, that is, until she meets Alex. Delirium is a polarizing series, almost everybody I have talked to hated the ending, because it just ends in the middle of a plot point. Going into the series knowing that, I felt like I was fine with ending. The Giver– This was probably the first dystopian I ever read and one of the first books that ever made me cry as a child. It follows the story of Jonas who is chosen to be the new Receiver of Memory in his community. Under the tutelage of the old Receiver, he remembers the past and learns to see things like color for the first time. Fahrenheit 451– One of the dystopians that outraged me the most, in Fahrenheit 451 people spend all of their days in front of large TV sets and all books that are found are burned. Anthem– A book where the sense of identity is so stripped that the main character refers to himself as “we.” It took me half of the book to realize he was talking about himself alone. A quick dystopian read. Divergent– A future where everybody is broken up into five factions. On “Choosing Day” each person choose which of the factions they want to be apart of of, Dauntless (Brave), Amity (Peaceful), Erudite (Intelligence), Candor (Honesty) and Abnegation (Selflessness). Tris, born Abnegation, decides on choosing she belongs in a different faction and now must learn to fit in. This book ranks in my top ten favorite books of all time. It is action packed without sacrificing plot. Have you ever read Yevgeniy Ivanovich Zamyatin's We? It's such a criminally underrated dystopia. The book was published during the 1920s, and is also rather notable for being perhaps the most un-Russian Russian novel most people can think of. Seriously, there are almost no hints of the story's cultural setting. You can't have a list like this without The Hunger Games and Divergent, can you? I also agree with your choice of Delirium. That was a great book. The others in the series… not so much. I still need to read uglies and the handmaidens tale! I love hunger games and the pretties/uglies series. And I've heard great things about matched. Thanks for the suggestions, I've needed new books to read! Future books are popular today. Love the Hunger Games movie but have yet to read the novel. Great theme. Ah, Uglies. That was my first intro to the genre. Great books- Hunger Games and Matched too! Stop by my giveaway if you have a moment! Awesome list! I really want to check out Fahrenheit 451. Gah.. I'm not a reader – but I do love Hunger Games the movie! 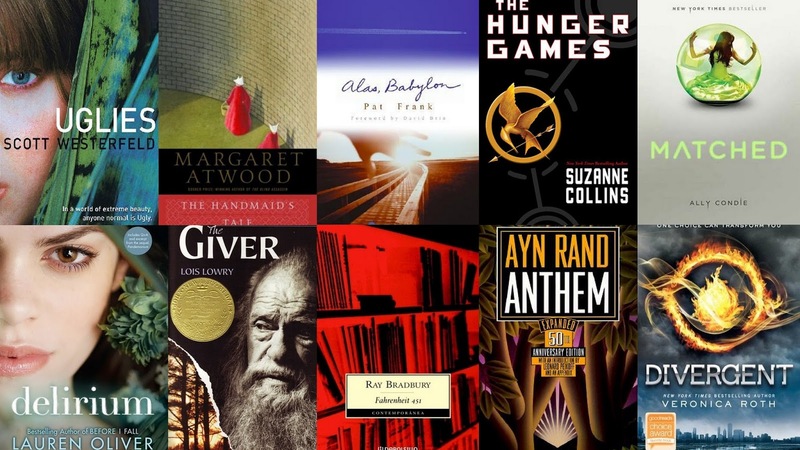 I love dystopian, too, and you've mentioned some of my very favorite books in the genre. I also adore The Lunar Chronicles series by Marissa Meyer, the Chaos Walking series by Patrick Ness, and the Gone series by Michael Grant. Lots of great dystopians out there!